While we're cruising along the interstate, I thought I'd share some of my recent finds at one of my favorite stores-TJ Maxx. TJ Maxx and HomeGoods are my happy place. I could easily spend hours of time and hundreds of dollars at them every time I go. My favorite thing about them is that they sale designer style items but at budget-friendly prices. And because they get new shipments in all of the time, you never know what goodies you'll come across! Can you hear the excitement in my voice? Seriously. Kid in a candy shop=Mallory in TJ Maxx. We didn't have either of these stores close to us when we lived in Oklahoma, so I've been trying to not go too crazy with visits while I'm here in Alabama. However, I have taken a few several trips in the past couple of months. 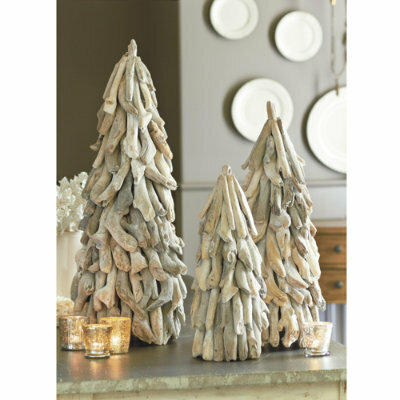 Most recently I was able to snag a few great Christmas decor items at TJ (yes, we're on a first name basis), one of which looks like something right out of the Ballard Designs catalog. Here is Ballard's version of a driftwood tree. The medium-sized one (about the size of the one I bought) is $69 buckaroos. And here is the version I got from TJMaxx for only $29.99. While it's not exactly the same, I still love it... maybe even more than the BD one.